Don’t Let the Evil Weevil Get Your Agaves! I first suspected that agave snout-nosed weevil had arrived in my rural community north of San Diego when I noticed a collapsed Agave americana in a friend’s yard. I could barely believe it. She lives atop a rocky hill surrounded by acres and acres of chaparral. Either the weevil had arrived via infested nursery stock (on a different agave most likely, seeing as the dying plant was part of an old colony), or it had walked in. Yes, walked. 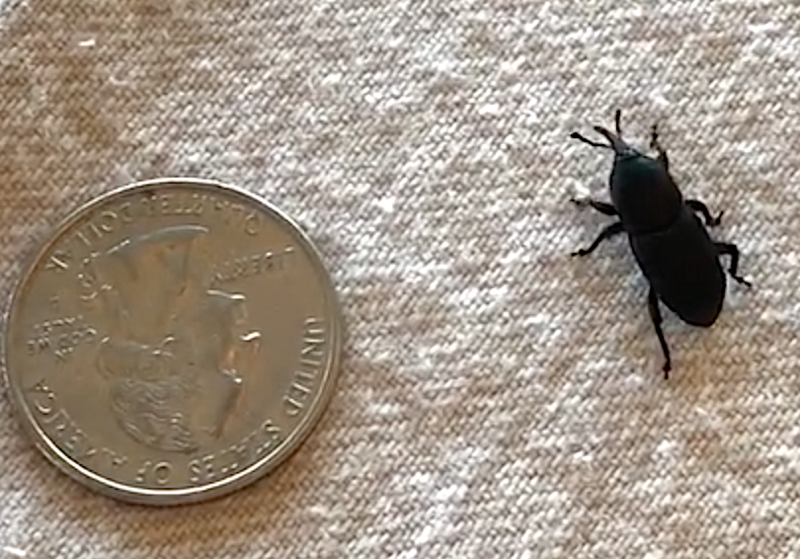 It’s a flightless beetle. I’ve since observed that it takes a captive weevil ten days to die despite receiving no water nor food. “Mine” traveled about 4 inches per second and was a good climber. Consider: If a dying agave hosts dozens of grubs that turn into beetles, and they scatter in different directions, one or more will certainly find another agave. This fast-spreading pest prefers variegated (striped) Agave americana (century plants) but will go after other species and members of the Agavaceae family. It leaves behind collapsed plants with gooey, grub-infested cores. The snout-nosed weevil, which originated in Mexico, is on the march worldwide. It is now ranked among the 100 worst by the Global Invasive Species Database. If you live where agaves thrive in landscapes and gardens, snout-nose is likely in your area or soon will be. Because the beetle is most active in spring, now is the time to pre-emptively treat healthy agaves. Find out what experts recommend. How to tell if you have an infested agave. How, when, and why the beetle attacks. How to protect your plants from infestation. Which varieties are most and least at risk. Safe ways to grow agaves in weevil areas. How to remove an infested agave. Also see my YouTube video: Agave Snout Weevil Prevention and Treatment. Well that’s terrible news. treat those babies quick! Love the agave.. I have grown a few indoors .. but they got very big here in the midwest. thanks for your post..